And turkeys in my shower. Sometimes I wonder what are we doing. Then I am reminded that all next winter my family is going to eat well. We on our little parcel of land have the potential to grow and produce our entire winters nutritional needs. A lot of people have told me that they like to think that their meat just comes on little styrofoam packages in the meat section of the grocery store. I have to admit my change came about when I seen the huge chicken breasts in the grocery store. I remember thinking what a great deal it was. Then my son made me watch a documentary called Food Inc. I have never purchased chicken breasts from the supermarket again. The first few animals we processed and ate, we all ate in silence. I remember it was a process, one we had to come to terms with. I can honestly say that it gets easier. When you love and care for your animals, you have a deep sense of appreciation for what they provide you. You want to give them the best life possible. So we do. We pen raise or free range them. We are also going to raise our turkeys this year. I would break out in hives from eating supermarket turkey. I had to stop eating it at family gatherings. I look forward to Thanksgiving and Christmas. I will know exactly how my turkeys were raised, what they ate and how they were processed. I enjoy sharing our story as I think people can see how easy it is. We learned a lot over the years , made some mistakes and try something new each year. I tried putting my tomatoes into my garden patch today. So far I got about 12 plants in. 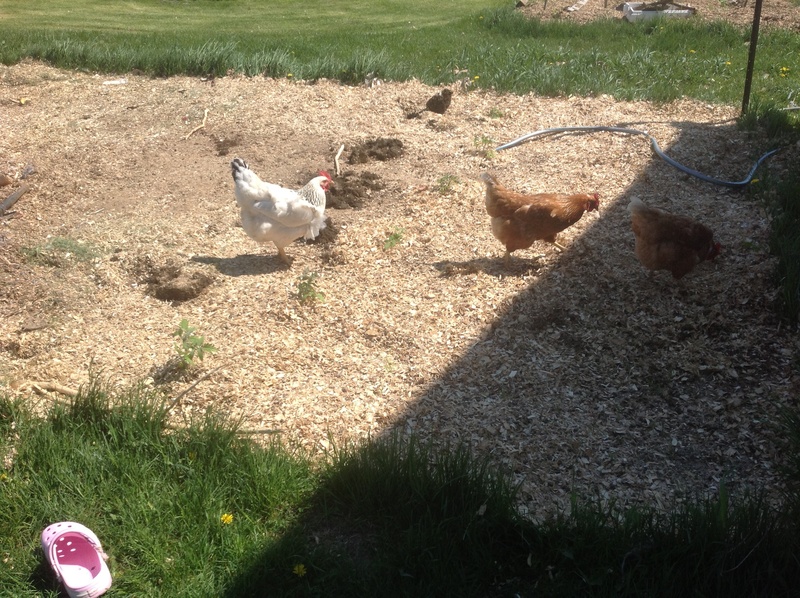 I have to periodically take a break every fifteen minutes as the chickens arrive to scratch the surface. I don’t blame them really. Our ground is loaded in earthworms because of the way we compost. I am glad that they don’t seem to want to peck at the tomatoe plants. At least when I am finished planting them, I won’t have to run chicken wire around them to protect them. I can see that they have made their way to the backyard once again, so I should take advantage of it and get back out. 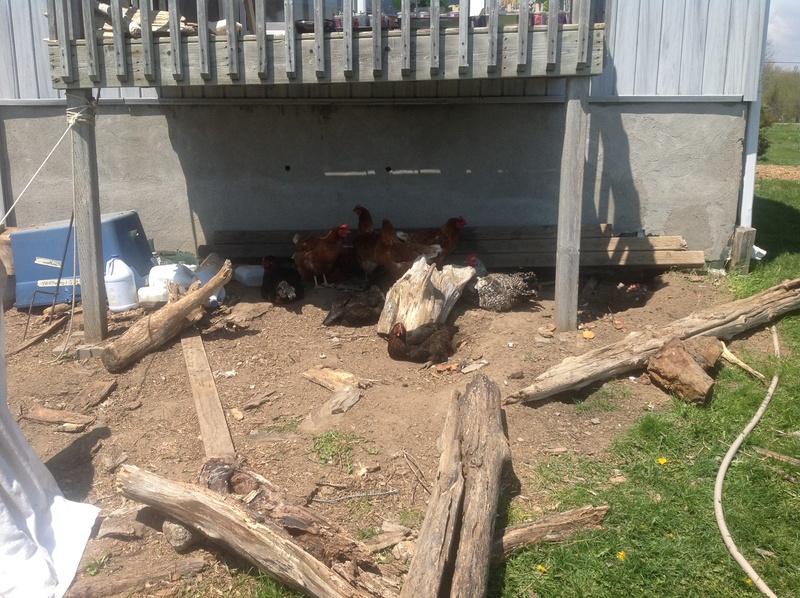 I am thinking before I get another four plants into the ground, all 15 of my chickens will be back again. This is Bently. We adopted him from a previous owner who was giving him up. He has issues. Since everyone in our family also has issues we decided he would be a good fit. We have over the years been evicted from dog parks and other public places because of his overwhelming love of us and his need to protect us. When we first started raising rabbits he thought they were a threat as well. We have decided that we needed to recondition his behaviour so over the winter we started to bring the bunnies to Bently for Bently to love. He would spend an hour licking and cleaning and investigating the bunny. Bently had two times jumped into the baby bunny pen. Now when it happens he just looks for them to play with. 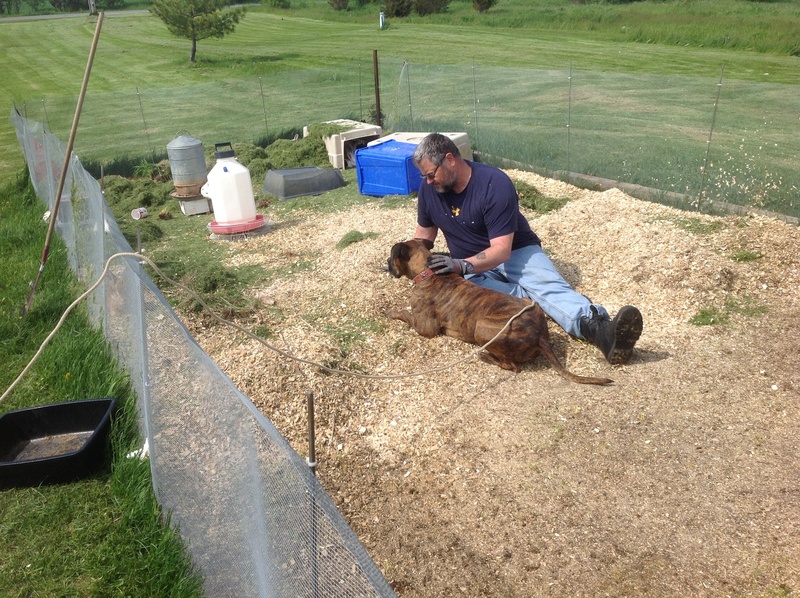 We still supervise when we are able and it definitely seems to be working. If nothing else it provides us with cheap entertainment. Our neighbour loves his lawn. Almost everyday I can hear him riding his lawn mower, pushing his lawn mower or using his trimmers. HE likes a nicely manicured lawn. WE on the other hand love the fact that we have a nice flat lot. The grass at the moment we let grow. There has been times when we have let it grow so long that my husband had to scythe it down. We sometimes laugh as people stop to take pictures. One of the reasons we let it grow is to get lush dandelions for our rabbits. They absolutely love them. 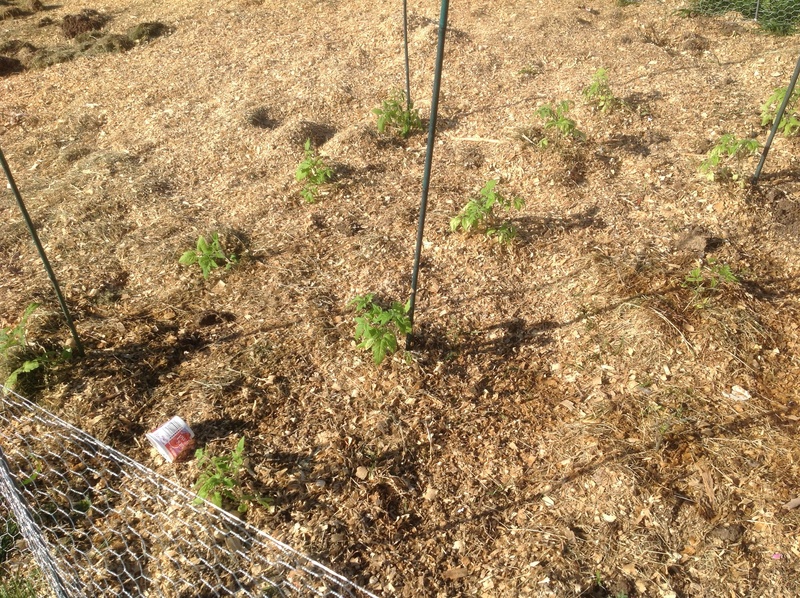 We also let it grow to rake it up and throw into the colonies for the rabbits to use as bedding in making their nests. In our gardens we use the grass clippings also as mulch. Piled around the fragile plants allow the weeds to be choked out and holds the moisture into the ground after rain. I used to cringe when I seen my husband do this because I always thought that grass seed would fall into my garden. Grass Seed does fall into the garden but the mulch capability far out weights that aggravation. 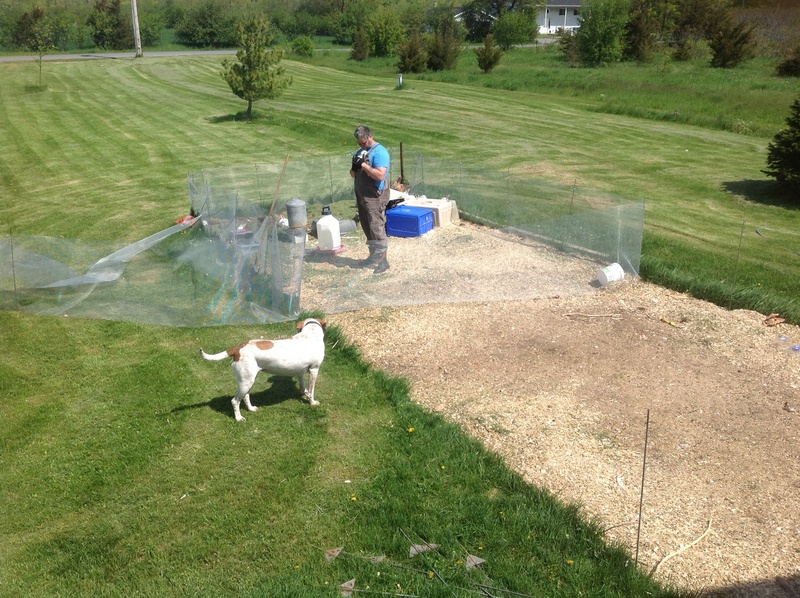 Today we will move our rabbit pen. 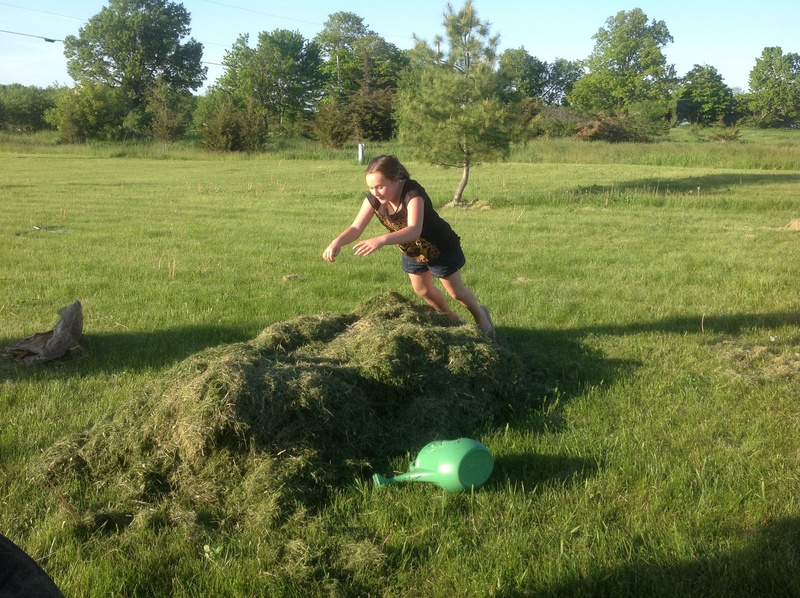 To a different section of the lawn in our attempts to make our lawn into a YARDIN. The young rabbits have done a fabulous job preparing my tomatoe patch. We will leave sections of the lawn in between the blocks of garden because we have so many uses for the fresh cut grass. I guess I can say we love our lawn as well but for completely different reasons. This was my rose garden. I had big dreams for this spot..I was going to move all the rose bushes I collected over the years at my old residence and place them under my Juliette Balcony. I was going to sit on my balcony in the morning and enjoy my morning coffee. The first year we lived here I did manage to move two of my rose bushes. In the meantime we collected some driftwood at the Pointe to build a primitive fence. Last year I pleaded with my husband to move them and it was always something that didn’t get done. 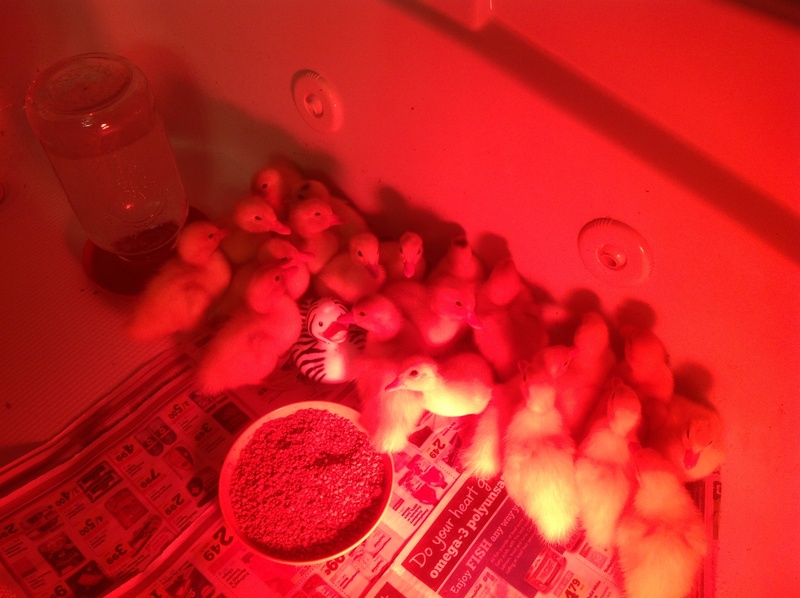 Then we got CHICKENS.. This is the first Spring for us with the chickens. We got them as day olds last July. I have never imagined that chickens take a bath every morning. A dry dirt bath. They claimed my rose garden as this spot. They roll around in it, they dig holes in it, splash each other in dirt, it really is a spectacle. My two rise bushes that have been placed there are completely gone now. Not really too sure where they went. 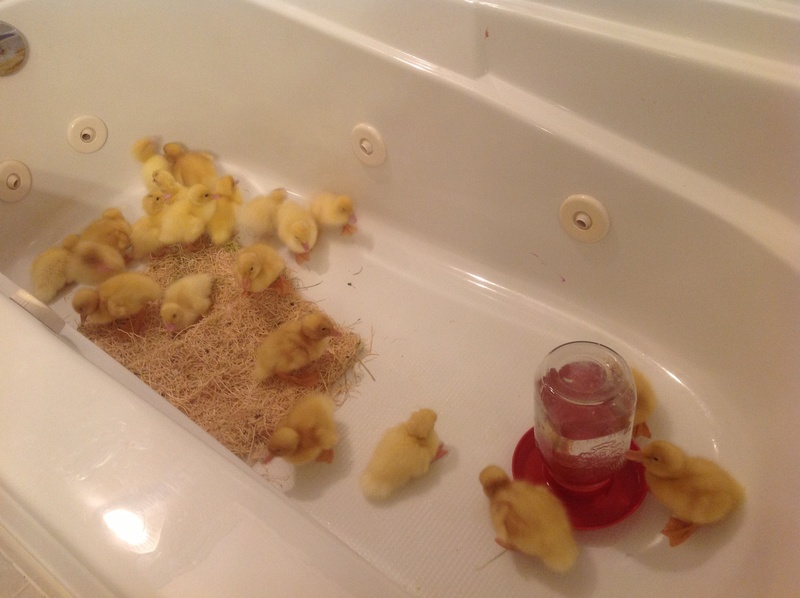 I do know that that as long as we have chickens this is going to be their bath. I could never reclaim it even it I wanted to. Like I tell my children and my husband, you need to pick your battles. The chickens win this one. How many times in our life to we come across that person who you appreciate and love, but are constantly challenged by? I find that I tried to limit human relationships like that, only to discover that you can’t avoid this. It is a part of life. Here on our little farm I am reminded daily of this challenge. I have been diligently trying to get my plants and seeds into my garden. I have set seeds into starter pots and have nurtured them over the last five weeks. I wanted to get an early start with my garden and decided to place them in the ground. Our chickens have learned that a working person in the garden means juicy worms to eat so they run as fast as their legs can carry them to our side. I really did not mind them plucking the worms from the dirt that I dug from the holes. I did, however, feel challenged by them the moment I tried to put the seedling in the holes. Quicker than I could get the ground piled securely around the seedling, the chickens had snatched the seedling from its place. A yell to my husband, to get “his” chickens out of my garden challenged my patience even more. He tried to defend the chickens and, explained that they like the tender plants just as much as people do. I learned over that day and the next, that the chickens were going to be a source of challenge for me. Every time I want to place a seed or seedling into the ground, I will have to figure out how to prevent the chicken from snatching it. I haven’t won this challenge yet and perhaps I never will. I do, however, need to understand that the chickens are going to continue to feast on my young seedlings. I am reminded that as much as I try to avoid relationships like this, they are inevitable, a part of life. Life gets really busy in the Spring. We are managing to expand our rabbit farm and our vegetable gardens. Each day we get up and make a mental note of what we would like to accomplish each day. 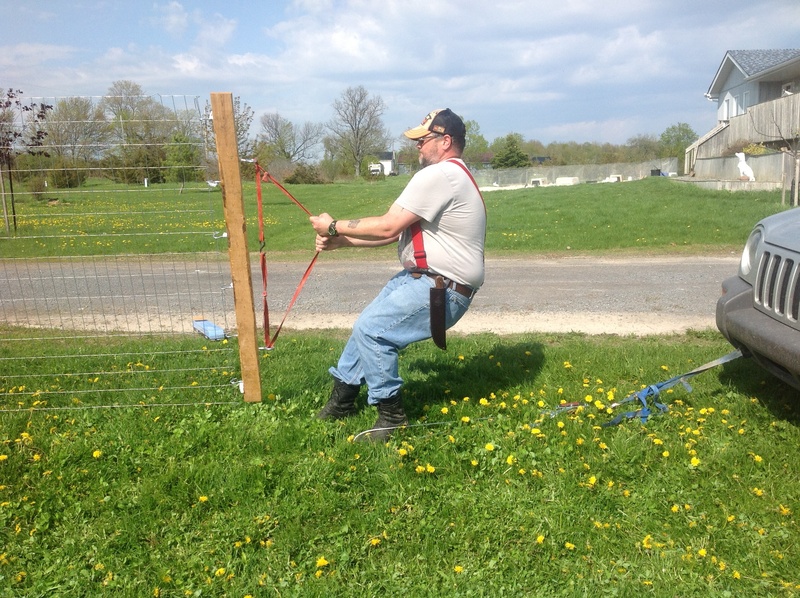 We are finding that little by little our dream of having a sustainable farm on 1 acre may actually be obtainable. The YARDIN is what my husband has been calling what we do. 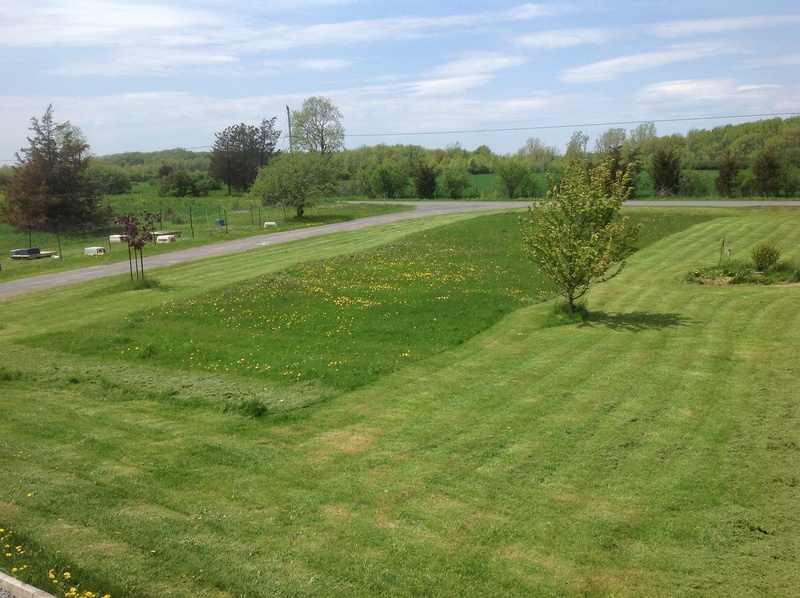 Converting a lawn into a garden. It is a lot of work but yesterday alone, I got cauliflower, broccoli, and two types of peas into the ground. So far we have been able to celebrate the small victories, getting a huge colony pen for our rabbits was a big hurdle for us to accomplish. Black Berry Bush, or maybe a Raspberry, I really cannot remember. I do, however, remember purchasing it and digging it into the ground. I done so with many, many plants. What I have learned the most is, buy mature plants from the nurseries if you want to eat the fruit in the next ten years. 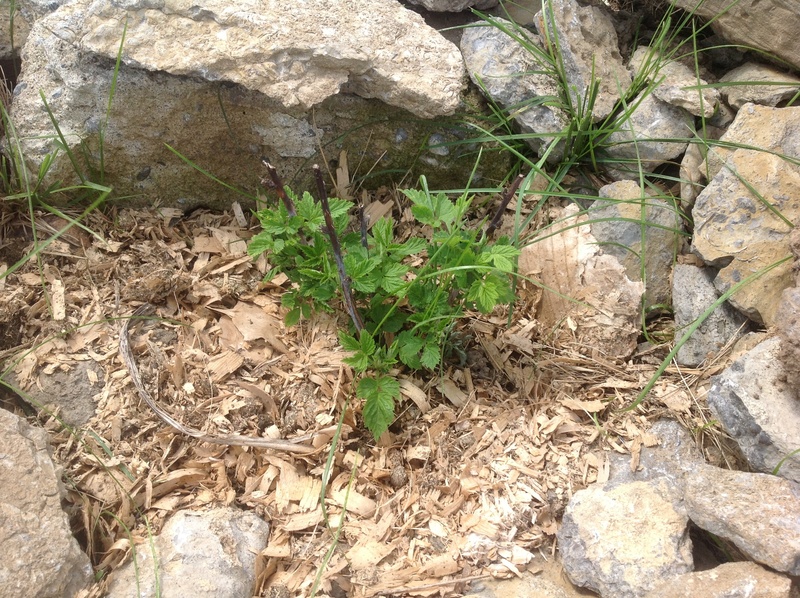 Although I am quite excited to see my now two year bush emerge from the winter I do know that it will be another seven before I see whether is is a raspberry bush or a black berry one. I have blueberry bushes that are in the same stage of development. This year I got smart though and asked for a mature bush for Mother’s Day. My clever daughter went to the nursery to buy my plant and for just a little more cost, I will actually be able to pick some berries from my bush this year.